What Unique Skills do You Bring to the Table as a Conference Producer? How Well Do You Work With Your Sponsorship Sales Team? Conference Producers: What Are Your Career Resolutions for the New Year? Upon finishing the 19th Global Indexing & ETF Conference in Scottsdale Arizona, I decided to hike up the majestic Camelback Mountain that loomed in the background outside of the conference room window. This was a rather challenging hike, and during the trek, I had several valuable life lessons reinforced. I hope you’ve heard these before, but a quick reminder never hurts. About a quarter of the way up the Echo Canyon Trail, there is a run that is so steep and smooth that you have to hold onto a steel banister in order to scale it. I got about halfway up and started to have serious doubts about my ability to successfully conquer this trail. My colleagues called encouraging words from the top, but I was becoming primarily concerned about holding them back if I got into trouble. What drove me forward was when the people below me told me they thought I could do it. This was a true vote of confidence, rather than well meaning, but perhaps misguided words of encouragement coming from above. Why? Because if I slipped and fell, they would pay the price, probably worse than I would. When you come up with a new idea, it’s fairly easy to find people to cheer you on. Much harder is finding people to put their money where their mouth is. This is why finding sponsors for a conference early on is critical. Of course the financial support is important, but more important is having a partner with skin in the game. Someone who is willing to share the risks. About halfway up, I met a white haired gentleman with a beard. Now, I shouldn’t have to tell you that when you meet the old man on the mountain that this is a person you ought to listen to. He had seen me leaning forward to grab rocks with my hands for balance. He advised me to stand up straight. “When you lean forward like that, you put a great deal of pressure on your diaphragm and work against yourself,” he said. He also advised me not to take steps that extended my leg beyond my knees. I took his advice and had a much easier time. When working on any new project, the best thing you can do is utilize the wisdom of others – this is the entire premise of attending a conference. From writing the agenda to running the sessions, the quality of a conference program depends on the wisdom of the industry people you rely on for input. While research papers and industry overviews make for insightful sessions, never underestimate the value of panels where practitioners share what they’ve been working on over the past year. As already mentioned, their skin in the game makes for a valuable perspective. I’m such a slow hiker, that this one applies more to the people who passed me on their way up and then again on their way down. But it illustrates the community that can form on the mountain. It pays to be friendly, because when you’re struggling, some familiar faces are a comfort. It’s a reminder that as you climb the ladder of success, to remember who helped get you there. Networking and team building are lifelong processes. While the whole “up” and “down” analogy might not be appropriate, the idea is to remember who is there to help out when you need help and treat them with appreciation. Camelback Mountain is 1280 feet high from the bottom of the trail to the top – about 30 feet higher than the Empire State Building. Within the first five minutes, I almost fell when I stumbled on some loose dirt because I was looking at the mountain above rather than the ground in front of me. Hiking itself can be a very zen like experience because each step is a challenge that requires presence and concentration. Yet after three hours of these countless moments I had conquered this formidable mountain. I think the biggest scourge of our modern work world is the inclination many of us have to multi-task. Conversely, the biggest challenge is learning how to prioritize in a manner that allows you to do one task at a time in environment where many tasks demand your attention. Sometimes the demands of a big project can seem impossible. But here is the thing. The truth is that you can only do what you can do. So the best approach is to do one thing at a time, and focus on that one thing. That is all you can do. But if you focus, and continue to do one thing after the other, more often than not, you will find out that you will achieve what seemed impossible. One thing I love about being a conference producer is that I get to introduce the event. It’s a moment of minor importance – it can cynically be viewed as a way of killing time as the crowd filters in for the opening speaker or panel. But to me, it’s a moment to absorb the fruits of my labor. With all the work that my team puts into creating the event (and they do a lot! ), it is an honor and pleasure to overlook the vista of people who appreciate our efforts. It might not quite be the Ocean from the Led Zeppelin song, but it is a crowd that I helped build. 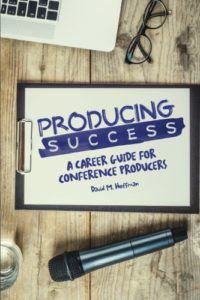 For more inspiration gleaned from the aftermath of industry conferences read my book Producing Success: The Only Career Guide for Conference Producers. Click below to buy your copy now!